First Aid CPR /AED Training for Childcare | BabySecure Inc. The reason that I am writing to you is to sincerely thank you for your informative course - a course that I honestly hoped that I would never have to put into practice...however, tonight my husband and I were having dinner with my 13 month old daughter when she got a piece of chicken lodged in her throat - I had to perform the abdominal thrusts and it popped out. My husband admitted to not having a clue what to do in such a situation and thanked God that I was there. It was a terrible situation and one that I pray that I never have to re-live, however at the same time, very empowering. It is with tears in my eyes that I Thank You from the bottom of my heart - because of you and your wonderful course, I was able to save my beloved daughter without a hint of hesitation. Heidi. Babysecure is a TRAINING PARTNER of the Red Cross. Training Partners are contracted satellite companies who are affiliated with the Red Cross and through whom their First Aid or Water Safety courses are taught. Training Partners are required to follow the teaching standards of the Canadian Red Cross which includes insurance coverage, course content, time frame and student-to-teacher/manikin ratios. Also required in the price of the course are the accompanying copyrighted course manuals for each participant to have as continued reference after the course. Instructors with Training Partners are required themselves to attend regular recertication courses which update them on current recognized First Aid Guidelines. When looking for a course, for your own security, BEWARE of any course given by instructors who say they are accreditated, (even if taught by a nurse and in a hospital), but issue so-called certification cards from their own business. Unless a card is issued by a recognized First Aid Training Agency such as the Red Cross, you have no guarantee that the instructor is actually supervised by an accredited in First Aid organization, are therefore updated on current guidelines or have any insurance. This could be a serious problem for you if you ever helped anyone in your care with First Aid. Upon successful completion, the participants in Babysecure courses receive cards directly from the Red Cross, recognizing they have taken a course from a qualified updated instructor and are covered by insurance. Cards are mailed directly to participant's addresses by the Red Cross within 1-2 weeks from the last day of the course. Training partners invest in their own equipment and their instructors are paid based on fees generated from those attending the courses. Instructors are not salaried employees of the Red Cross. Most people do not realize there are several different types of First Aid and CPR/AED (Automatied External Defibillator) courses. 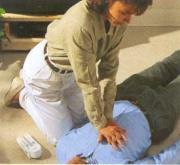 You can take CPR/AED courses alone or in combination with First Aid content. CPR/AED training is learning what to do in a life threatening emergency when breathing and heart stops. First Aid courses cover the CPR/AED training and then adds learning what to do with with the variety of other injuries such as broken bones, head injury, poisoning, amputations, burns etc. Red Cross course outlines are geared to the needs of the person wanting to take a course. Following are the list of the types of courses that can be offered by Red Cross instructors, with brief description of content and time frame. Emergency Childcare First Aid Course Content. This coures meets the new requirements of the Ministere de Famille for Daycare workers as of April 2016. #20. A permit holder must ensure that each childcare staff member holds a certificate not older than 3 years attesting that the member has successfully completed a minimum 8-hour early childhood first aid course including a component on the management of severe allergic reactions or a minimum 6-hour refresher course updating the knowledge acquired as part of the early childhood first aid course. This information appears on the back of the card you will receive on completion of the course. While respecting the Red Cross course content, our courses adds safety and prevention information beyond what any other course offers. Courses are taught by Nancy Reynolds, a Certified Professional Childproofer with 30 years of experience in specialization in childhood safety. In our fast paced world, trends are to have courses as short as possible and people question the length of ours. Babysecure follows the recommended guidelines of the Red Cross and what has been developed as the adequate time frame to cover the information. We take the full time to explain, practice the skills, answer questions and expand on how the information applies to real life situations. What could be a more important for anyone to do but take the time to learn how to save a life? Open registration training sessions are held at Montreal's St. Mary's hospital. St Mary's has no involvement in the administration of the course. The hospital generously provides the room for the course to be held. Babysecure does not have an office at the hospital. Courses are also arranged for private groups at either St. Mary's (depending on room availability) or place of your choice. Young babies ideally under 6 months are welcome to attend the course with their parents if they do not have sources of babysitting or are breast feeding. We leave it to the discretion of the families. We consider that they know their own children and how much care their babies might need over the time of the course yet still allow themselves and others in the course to concentrate on this lifesaving information. Please let us know if you plan to bring your baby as classroom and numbers in the group may not make it appropriate for every course. If the babies are older, you do not find you could concentrate with the baby with you or have no sitter and both parents want to take the course, then we suggest parents alternate the times they come to the course. One come on one date while the other babysits and on the next convwenient course date, you switch roles. In order to plan appropriately and be fair to both Babysecure and other participants wanting to take a course, it is necessary to have you arrange payment before the class. It is our experience that some people will sign up but do not come to the course. When registration for a course becomes full, we have to turn away people who might have wanted to come. Payment is the means of Babysecure knowing the commitment to take the course. There is a cancellation fee for shorter than 48 hour notice. If there are insufficient numbers to cover the costs of giving the course, the course may be cancelled. As one of the only English speaking Red Cross courses in Quebec, we have people coming from regions outside the Montreal area. No one, including the instructor wants to make the arrangements to go to the course and find that it gets cancelled. Payment in advance helps to avoid having to cancel a course. If the course does not run, participants are emailed/phoned before the day of the courese and cheques are either torn up or put towards the next date. In order to avoid playing telephone tag, the majority of communication between participants in courses and Babysecure will be done by email. Please check your emails regularly after signing up for a course. ALSO, EITHER ALLOW EMAILS FROM BABYSECURE OR CHECK YOUR JUNK MAIL, AS SOME SECURITY SYSTEMS MAY BLOCK OUR NOTICES. For dates and to sign up for the regularly scheduled courses please click on-line registration and follow the steps described to save your place.